Gateway Holiday Park Announced for Wales! : Theme Park News & Construction! Board index ‹ Theme Park Discussions ‹ Theme Park News & Construction! 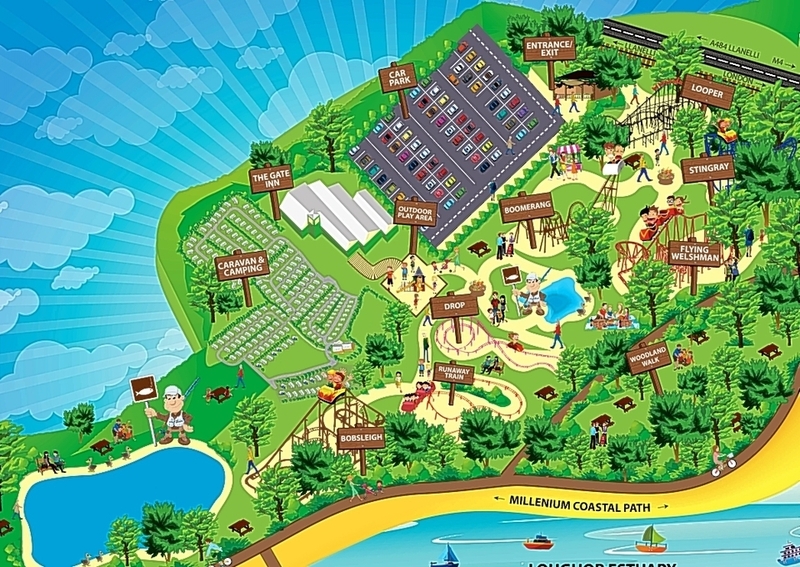 ‹ Gateway Holiday Park Announced for Wales! An existing caravan & camping site in Wales has plans to build an amusement park for 2018. Gateway Resort are gearing up to submit a planning application early next year that would see a 20 acre site developed just off the A484. The plan is for 26 rides across the site, which will become the Gateway Resort from Easter. One of them will traverse the lake within the site and will be licensed as the only one of its kind in Britain. Vekoma Ride Manufacturing, one of the largest roller coaster builders in the world, have been lined up to design and install the ride. Mr Strelley says some of the planning applications will be for full permission and some for outline as the site is developed. The exact theme for the park is still being decided upon. "There will be a large indoor barn full of rides and a 4D virtual reality simulator, of which there is only one other in the world, in Canada. Looks like a pretty good variety of coasters, though it seems strange that they have both a Flying Dutchman and a Stingray. Last edited by Paradox on December 28th, 2015, 12:55 pm, edited 1 time in total. Re: Gateway Holiday Park Announced for Wales! ^You can also see a Boomerang and an SLC on the image. Yup it's in the list of planned coasters, but they are the normal stock models so I didn't think including images for those or the Gerstlauer's were necessary. I wouldn't say the SLC will be bad, though seeing as how the one Vekoma built in Poland looks smooth. no flat/tower rides, just roller coasters? This is still just very early concept art. As of now, no flats have been announced, but they could be possible for the future. Are they trying to make another Six Flags Magic Mountain? Layout for the flyer looks neat at least for what it does. Wow a great collection of coasters! They did it longer before. It just took a while before a park actually showed interest/bought it. It's the park the lowest bidder built. Eh I'd put all Italian companies as the lowest tier. Just outside Swansea which makes it more viable than Oakwood for the majority of people. Interested to see how this develops! SF St Louis and America welcome Holiday In The Park in 2016!